Pool Openings - Rintoul's Leisurescapes - Above Ground, Inground Pool and Landscape ideas for Owen Sound, Port Elgin and surrounding areas. note: Due to TSSA regulations, you will need to contact an authorized dealer to light your gas heater. 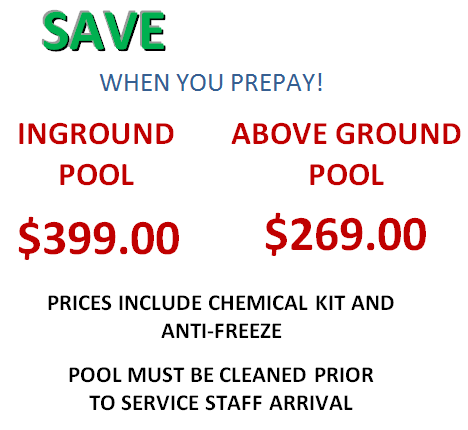 The maintenance program includes checking and adjusting of the automatic pool cleaner, cleaning the waterline when necessary, backwashing and cleaning the equipment. The pool will be brushed and cleaned when necessary. Chemicals are added and the water is balanced. The service also includes vacuuming the pool. BOOK AND PREPAY YOUR POOL OPENING BEFORE MARCH 31ST 2016 AND DO NOT PAY THE TAXES! !